Jeong-Yup Lee, Boris Solomyak. On substitution tilings and Delone sets without finite local complexity. 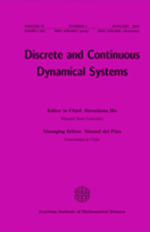 Discrete & Continuous Dynamical Systems - A, 2019, 39(6): 3149-3177. doi: 10.3934\/dcds.2019130. Tadahiro Oh, Mamoru Okamoto, Oana Pocovnicu. On the probabilistic well-posedness of the nonlinear Schr\u00F6dinger equations with non-algebraic nonlinearities. Discrete & Continuous Dynamical Systems - A, 2019, 39(6): 3479-3520. doi: 10.3934\/dcds.2019144. Etienne Emmrich, Robert Lasarzik. Weak-strong uniqueness for the general Ericksen\u2014Leslie system in three dimensions. Discrete & Continuous Dynamical Systems - A, 2018, 38(9): 4617-4635. doi: 10.3934\/dcds.2018202. Terence Tao. On the universality of the incompressible Euler equation on compact manifolds. Discrete & Continuous Dynamical Systems - A, 2018, 38(3): 1553-1565. doi: 10.3934\/dcds.2018064. Anna Geyer, Ronald Quirchmayr. Traveling wave solutions of a highly nonlinear shallow water equation. Discrete & Continuous Dynamical Systems - A, 2018, 38(3): 1567-1604. doi: 10.3934\/dcds.2018065. Gheorghe Tigan. Degenerate with respect to parameters fold-Hopf bifurcations. Discrete & Continuous Dynamical Systems - A, 2017, 37(4): 2115-2140. doi: 10.3934\/dcds.2017091. Peter Bates, Danielle Hilhorst, Hiroshi Matano, Yoshihisa Morita. Preface. Discrete & Continuous Dynamical Systems - A, 2017, 37(2): i-iii. doi: 10.3934\/dcds.201702i. Ellen Baake, Michael Baake. Haldane linearisation done right: Solving thenonlinear recombination equation the easy way. Discrete & Continuous Dynamical Systems - A, 2016, 36(12): 6645-6656. doi: 10.3934\/dcds.2016088. Micka\u00EBl D. Chekroun, Michael Ghil, Honghu Liu, Shouhong Wang. Low-dimensional Galerkin approximations of nonlinear delay differential equations. Discrete & Continuous Dynamical Systems - A, 2016, 36(8): 4133-4177. doi: 10.3934\/dcds.2016.36.4133. Alexandre J. Chorin, Jeffrey Rauch. Preface. Discrete & Continuous Dynamical Systems - A, 2016, 36(8): i-ii. doi: 10.3934\/dcds.2016.36.8i. Mary Chern, Barbara Lee Keyfitz. The unsteady transonic small disturbance equation: Data on oblique curves. Discrete & Continuous Dynamical Systems - A, 2016, 36(8): 4213-4225. doi: 10.3934\/dcds.2016.36.4213. Takayuki Kubo, Yoshihiro Shibata, Kohei Soga. On some two phase problem for compressible and compressible viscous fluid flow separated by sharp interface. Discrete & Continuous Dynamical Systems - A, 2016, 36(7): 3741-3774. doi: 10.3934\/dcds.2016.36.3741. Anotida Madzvamuse, Hussaini Ndakwo, Raquel Barreira. Stability analysis of reaction-diffusion models on evolving domains: The effects of cross-diffusion. Discrete & Continuous Dynamical Systems - A, 2016, 36(4): 2133-2170. doi: 10.3934\/dcds.2016.36.2133. Kung-Ching Chang, Minyou Chi, Wei-Ming Ni, Zhuoqun Wu. Preface. Discrete & Continuous Dynamical Systems - A, 2016, 36(2): i-iii. doi: 10.3934\/dcds.2016.36.2i. Weigu Li, Jaume Llibre, Hao Wu. Polynomial and linearized normal forms foralmost periodic differential systems. Discrete & Continuous Dynamical Systems - A, 2016, 36(1): 345-360. doi: 10.3934\/dcds.2016.36.345. Ellen Baake, Michael Baake, Majid Salamat. The general recombination equationin continuous time and its solution. Discrete & Continuous Dynamical Systems - A, 2016, 36(1): 63-95. doi: 10.3934\/dcds.2016.36.63. Baojun Bian, Shanjian Tang, Qi Zhang. Preface. Discrete & Continuous Dynamical Systems - A, 2015, 35(11): i-iv. doi: 10.3934\/dcds.2015.35.11i. Jean-Baptiste Caillau, Maria do Ros\u00E1rio de Pinho, Lars Gr\u00FCne, Emmanuel Tr\u00E9lat, Hasnaa Zidani. Preface. Discrete & Continuous Dynamical Systems - A, 2015, 35(9): i-iv. doi: 10.3934\/dcds.2015.35.9i. Elena Celledoni, Jesus M. Sanz-Serna, Antonella Zanna Munthe-Kaas. Preface. Discrete & Continuous Dynamical Systems - A, 2014, 34(3): i-ii. doi: 10.3934\/dcds.2014.34.3i.